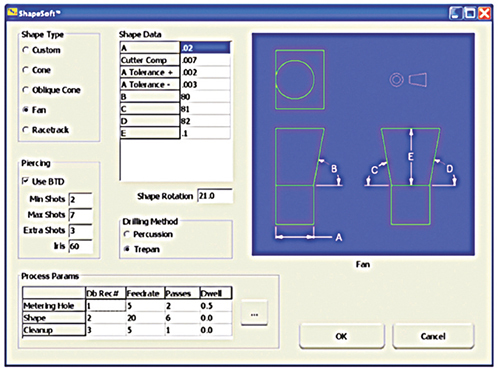 Prima Power Laserdyne, Champlin, MN, has added a new software feature, called ShapeSoft, to its Laserdyne S94P control that simplifies the creation of programs for producing cone, oblique-cone, fan, racetrack and a variety of other shaped holes. The feature promises to find a home for a range of turbine-engine applications including cutting of blades, nozzle guide vanes and combustor. 3) Machine the metering hole to remove any material that may have accumulated in the metering hole during the shape-machining process. ShapeSoft allows the user to select process parameters for each of the three process steps—the relevant parameter database record, feed rate and dwell time (after the shutter is open and before processing begins). For the shape in Step 2, the number of passes (or revolutions around the shape) to create the final shape also is specified. System motion is modified as required to produce the shaped holes at the specified laser-beam orientation called out in the drilling program. This allows repetition of a single shape and single macro as many times as is required to produce the specified shape, at various locations on a contoured 3D surface.